We are SO excited about being able to offer a lower cost, high quality Responsive Theme Solution for our clients. We are finding that our coveted Premium Sites are sometimes simply out of the price range for smaller inns, so we felt that for our 10 year Anniversary in 2012 we needed to find a way to help those who desperately need an improved Web presence, but are unable to afford the higher cost of a Premium Design. 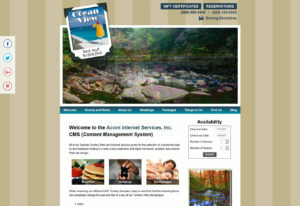 Thus, we developed our Acorn Internet Services CMS Responsive Theme Option. Our Responsive Theme Solution was NOT designed to replace our high end Premium Designs, but to provide a very different type of alternative for those who haven’t updated their web presence in years due to budgetary constraints. If you have any questions about our CMS Responsive Theme Systems, please contact us at 877-226-7699 or E-Mail sales@acorn-is.com for more information. This entry was posted in General and tagged Lower Cost Alternative, New Design by admin. Bookmark the permalink.